Virginia is a long two day drive from Texas but we were well-prepared with several audio-books including The Man who Corrupted Hadleyberg and Other Stories by Mark Twain and Tarzan King of the Apes. We stopped for a late lunch/early supper at what turned out to be local greasy spoons. The waitresses were friendly and kept our coffee cups filled but we certainly got our monthly quota of grease. Most of the trip had been on major interstates with few turns but once we got close, we had to play close attention to road signs and TomTom’s directions. Even so, I made a wrong turn. Driving in a relatively strange place in the dark and fog is never fun but somehow we managed to find our way and things began to look familiar. Carolyn met us at the entrance to the road and we slipped and slid out way through snow and patches of ice and slushy gravel to their house. Snow covered the fields, but the fireplace was warm and particularly inviting as the heater fan had died in my truck just two hours earlier. 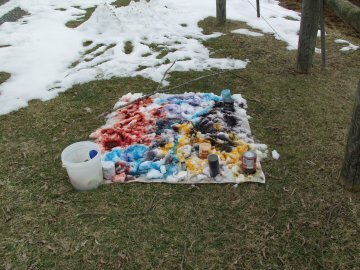 I was pleased to see the snow as I had brought along some of my liquid dye on the off-chance there might still be snow so I, too, could try out snow-dyeing. The next day, Glen and his brother-in-law Tom went shopping and did some repair work on some farm equipment. I was delighted when Tom bought me a canvas drop-cloth for me to do my snow-dyeing and Glen bought me a model Ford 8N tractor and T-shirt. Tom also generously shared his Heavenly Hash ice-cream. One of the projects was converting slides and old movies to DVD’s or CD’s so they could be viewed on a computer screen or on the big screen TV. Some of the photos had never been seen by the siblings—photos of their maternal grandparents who had both died long before most of them had been born. We spent a pleasurable evening looking at old photos and the next day I sorted through the boxes of slides, movies, and photos selecting two large boxes of photos to take home with us to sort out. Another project was to clean out my mother-in-law’s refrigerator and her stash of plastic containers. It’s one of those fiddly tasks that no-one likes to do. 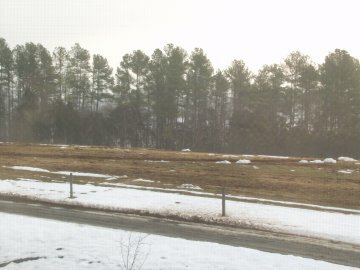 Snow melted on the fields and my dye project; the wind rattled the standing seam metal roof, and I had to chase after my dye pots that had escaped into the pastures amidst the cattle. We had a brief tour of Tom’s remodeling job (very nice although he didn’t think much of my idea of a bead curtain in the bathroom to solve the problem of limited door opening space), chatted and took a few walks despite the biting wind, but the time seemed to fly by and on Friday we packed up and headed for home. We had planned a short trip through Shenandoah National Park so we could get a stamp for our Parks Passport, and take some photos but it was closed due to the snow. Glen convinced the ranger to stamp our passport and although the dates are wrong—she wasn’t wearing her glasses—the year is correct and we’ll have to try another time to see the park. We stopped in Chattanooga and had a surprisingly excellent meal at a Café attached to a Best Western. Neither of us needed much after our ample lunch at a Bob Evans restaurant and we thought we might have just an appetizer. We shared a Greek platter with French Fries to rival McDonald’s along with the spinach pie, Greek salad, lamb, etc. Both of us were stuffed too full to even contemplate the wonderful desserts displayed at the entrance. The final day of our drive was uneventful as we occupied ourselves with listening to The Song of Hiawatha and Huckleberry Finn. We stopped at Landry’s in Lafayette for some fabulous Cajun seafood but most of my supper came home with us—the Sashimi appetizer and salad quite filled me up. It was dark when we arrived in Beaumont and for a few minutes we thought we were in Mexico as a car drove up and down the streets with Mexican music playing loudly—maybe a wedding? Our driveway still had the huge pot-hole filled with water and mud even though I had hoped it would have magically disappeared while we were gone. Catching up with mail and telephone messages is always the part of being away that I dread facing upon return.